Finally, finally, finally! Too long ago, Judy Lynn at Seize the Book blog surprised me by sending me a copy of Winston Churchill (Christian Encounters Series) . If you'd like to catch her thoughts this book - CLICK HERE to read her review. Ever since I read her review I was dying to read this! (Well, maybe not dying.) But she knew of my enthusiasm and popped it in the mail. How sweet is that? (Thanks, Judy!) Therefore, because I am reading the book thanks to Judy, I'm linking this up to the I Read It Carnival at 5 Minutes for Books today. I finally had a chance to sit and devour it, and devoured it I did. At a mere 158 pages, this is a quick and easy overview for anyone who might be interested in learning more about Winston Churchill. Admittedly, I was curious about why Churchill was appearing in Thomas Nelson's Christian Encounters series. For anyone who is more familiar with these books - I'd certainly appreciate hearing more about the purpose behind them. I did read and reviewed the book on Jane Austen from the same series over at 5 Minutes for Books (click on her name to see my review) and had the distinct impression that Thomas Nelson was highlighting people in history who held a believe in the God of the Bible. However, I would say that's not the case and they just want to point out what positions were held by notable personages throughout history? Anyone know the answer to this? 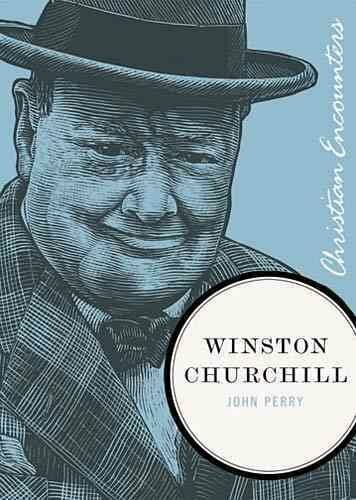 At any rate, I was mildly confused upon cracking up the book being that I didn't understand Churchill to be Christian. And indeed, he was not. Regardless of the purpose and design behind this Thomas Nelson title, I enjoyed the book for other reasons. I still haven't read an in depth biography of Churchill (the only book that I've read being Franklin and Winston: An Intimate Portrait of an Epic Friendship), so I considered this a little foretaste of things to come. This book gives a little history regarding his birth, his years in the military and, of course, what led to him becoming Prime Minister as England was led into World War II. I guess I don't have a whole lot to add to Judy's review except to say that it was a brief and general overview of his life and one I found interesting. I don't really get the purpose behind this book though which leaves me with a series of question marks. I'd feel better if I knew what the intent for this book was/is. But! The bottom line is that I enjoyed it. Yes, I did. And I'd recommend it to anyone who wanted to just learn a little bit about the man. Perhaps a high schooler? I think that this book is probably best suited for a younger reader and anyone who is serious about wanting to know more should look elsewhere. That's my take on it. Hmmm, the purpose of the series does seem to be a bit muddled. If they just wanted to do a general biographical series, they could have picked a different series name. It seems like they're muddling up the definition of "Christian." Putting that aside, Churchill IS someone I'd want to read more about. Thank you for the link to my blog, Carrie! You are such an encouragement to me. I enjoyed your comments on this book. I'm glad you like it! hi Churchill was a believer of sorts and did turn to prayer during the war he was as many English are, a nominal Christian it's really up to the lord about where they stand with him. I personally have no idea. But he did believe in god and prayed and read a bible.